Welcome to beautiful Wailea, a Master Planned Community which ensures good community planning and utilizes design guidelines to help preserve Maui's sophisticated island environment. Grand Champions Villas is located in the heart of Wailea and nestled between The Wailea Blue Golf Course, ranked among America's best resort courses by Golf Digest and The Wailea Tennis Club ranked as one of the country's 50 best resort tennis facilities. Across the street from the Villas is The Shops at Wailea where you will find luxury shopping and fine dining as well as the luxury hotel properties linked by a scenic pedestrian beachwalk. We are the proud new owners and just completed the remodel of this beautiful one bedroom, two bath villa. The style is beach house chic, beautifully comfortable and casual and not a bit too fussy. 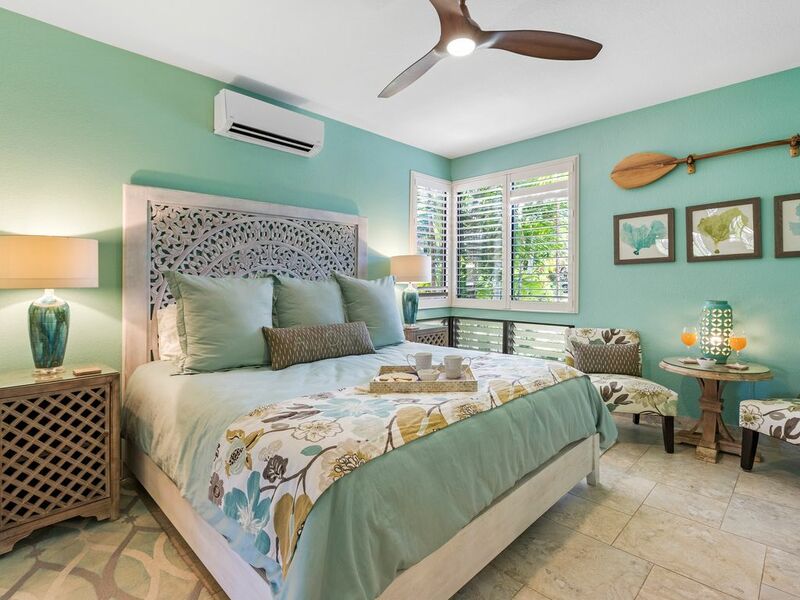 The villa has colorful accents, organic elements of shells, driftwood and seagrass. As our guest, you are coming for the sea, beach and relaxed Maui lifestyle and we wish to provide warmest aloha, beauty and comfort during your stay. Please check out our second condo at Grand Champions (www.vrbo.com/504417) to read our guest reviews. The reviews are the best indicators to let you know how we treat our guests and what you can expect us to deliver during your stay at this condo. My wife and I have traveled to Maui for years to escape the cold St. Louis winters. We have enjoyed Wailea's luxury resort properties. When we started our family, it was no longer practical to stay in hotels with limited space, compromise security with two separate hotel rooms and incur the food and beverage costs of our growing children. As business travelers we have had the opportunity to visit some of the most amazing cities but none of these locations have come close to the feeling of peace and serenity that we have found in Wailea. Grand Champions Villas is hands down the greatest value in all of Wailea. The central location, beautifully maintained grounds, security and space within the villas cannot be beat. There is a second full bath including tub, shower and vanity as well as large second closet off of the Living Room for guests using the pull out queen sleeper sofa. Enjoy watching golfers play the second hole of the Wailea Blue Course and putting on the green right outside of your lanai. Enjoy ocean views with truly spectacular sunsets from the comfort of your lanai. High quality egyptian linens provided as well as plenty of pillows. Throw pillows are upgraded in furniture grade fabrics. Full size washer and dryer provided for guest use on the lanai. Full size dryer provided for guest use on the lanai. Dedicated parking spot assigned to unit 85. Egyptian cotton towels provided. Plenty of towels, hand towels, face cloths and beach towels. Large living room/Kitchen/Office/Dining area. There is queen sleeper sofa with upgraded mattress. Both the sofa and club chairs are upgraded with down fill. There is a large desk and ergonomic chair. The kitchen is fully stocked with cook ware, utensils and brand new porcelain dishes. Dining table purchased 2016 including 4 dining chairs. There are also 3 barstools, purchased 2016, at the kitchen counter. Cable television is provided with 80+ channels. We provide beach chairs and beach towels for guest use. Grand Champions Villas are sided by the Wailea Tennis Courts. Grand Champions Villas are sided by the Wailea Blue Course. There are two pools on property. The pool near the office is designated the "family" pool and the second pool is designated the "quiet" pool. Guests are welcome at both from 8 a.m.-10 p.m.
A hot tub is located at both complex pools for guest use. Our family of 3 spent 9 nights in this inviting , beautifully decorated condo. All our needs of cleanliness , comfort and luxury were gratefully achieved. There is a fabulous view from the Lanai where you will be entertained by playful birds and a view of the ocean and Golfers. You will be comforted by the quietness and location. Easy access to the highway without the noise and congestion . A great highlight was the option of 2 pools on sight, one for family and one for adults only. Also provided were suggestions for food, activity and shopping. I cannot think of a single suggestion that would of improved our stay. What a beautiful condo we had such an amazing time! We had such a great experience.... this condo is very clean, decorated so nice, everything worked smoothly. It’s right on the 2nd hole of The Old Blue Course with a view of the ocean in the back ground. The sunset from the lanai was perfect every night! The only thing I wish we had was binoculars ... we saw whales in the far distance right from the lanai!!! I can’t wait to book again for next year!!! We truly enjoyed our stay here. The condo was well stocked, clean and comfortable. We loved watching the golfers putting on hole #2. We also enjoyed watching sunsets and rainbows from the lanai. Everything from appliances to pots & pans to dishes and silverware was top notch. A great home away from home. We stayed at this unit 3 years ago and are very happy that the new owners have redecorated the interior. It definitely makes you feel like you are on vacation and that is exactly what you want to feel when you’re in Maui. The “beachy chic” interior is light and refreshing. Everything we needed was provided for an easy-going stay. We have stayed at GC several times. This is one of the nicest rentals we've visited. Very clean and well appointed. Really appreciated the tile floors throughout. Washer and dryer are high-end and heavy duty. Will definitely try to book another stay in the future. For GC, this unit has a nice ocean view and, even though it was a bit early, we managed to see some humpback whales frolicking in the distance. We couldn’t honestly find anything that didn’t ma. We enjoyed every day of our two weeks. The view and everything that came with the condo was first class. We will definitely consider this first for our next visit. Tax ID:TA-118-085-8368-01. Add 14.42% Hawaii tax to the full rental payment amount (daily rate x length of stay). Guests must pay the $59 Damage Protection Policy. $400 of the full rental payment is due upon booking. The remaining balance is due 60 days prior to check in. Cancellations made outside of 60 days of check in receive a full refund. Cancellations made inside of 60 days of check in do not receive a refund unless the rental days are rebooked by another guest. Refunds are made on a pro-rated basis based on the days that are rebooked by another guest.